2008 Winsdown Caprice- (Chestnut Mare by Winsdown Westinghouse) 2008 Denver Queen City Futurity Weanling Grand Champion, Amateur Weanling Champion and Open Weanling Champion. 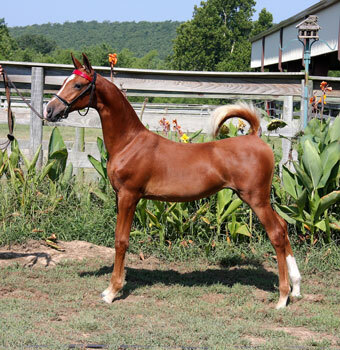 Calvary Episcopal Futurity Weanling Filly Champion. 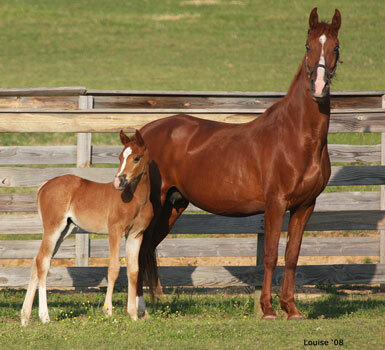 2008 Salina Charity Futurity Reserve Grand Champion Weanling and Weanling Filly Champion. 2008 State Fair Of Texas Futurity Weanling Filly Reserve Champion. Rare Enchantress by Rare Sensation- 1985 N C State Fair 3 Gaited Reserve Grand Champion and 3 Gaited Junior Champion. CH Rare Ralent RHF- 1991 Penn National 3 Gaited Ladies Champion. 1992 Children's Benefit 3 Gaited Amateur Grand Champion. 1993 Penn National 3 Gaited Amateur Grand Champion. 1994 N Y State Fair 3 Gaited Amateur Grand Champion. 1996 UPHA Spring Premiere Park Amateur Grand Champion. 1996 Devon Park Grand Champion. Rarely In Town- 1994 Virginia State 3 Gaited Grand Champion. 1994 N C State Fair 3 Gaited Amateur Gentleman Reserve Champion. 1998 N C State Fair 3 gaited Gentleman Reserve Champion. Tap Town (5 SR Points)- 1990 Children's Benefit Park Grand Champion. 1994 N C State Fair 3 Gaited 3 Year Old Reserve Champion. 1995 Raleigh Spring 3 Gaited Junior Champion.1995 Virginia State 3 Gaited Junior Champion. 2001 J D Massey 3 Gaited Novice Champion. 2007 Franklin County 3 Gaited Show Pleasure Adult Champion. 2008 Summer Fun Park Amateur Grand Champion. 2008 Tampa Charity Park Jr. Ex. Reserve Champion. 2008 West Coast Morgan Pleasure Driving Grand Champion. 2008 Georgia National Park Jr. Ex. Champion. 2009 Gasparilla Park Jr. Ex. Reserve Champion. 2009 Wright Family Charity 3 Gaited Show Pleasure Champion. 2009 Harvest Days 12 & Over Walk & Trot Grand Champion. 2010 Harvest Days Amateur Park Champion. The Dixie Cup Amateur Jr. Ex. Champion. Town Dancer- 2002 Indianapolis Charity 3 gaited Limit Champion. 2003 Mid-America Signature 3 Gaited Grand Champion. 2004 3 Gaited Champion. Rosehill's Top Of The Town- 1999 Roanoke Valley Fine Harness Junior Champion and Amateur Champion. Mac's Surprize Party- 1988 Roanoke Valley 5 Gaited 3 Year Old Reserve Champion. 1990 N C State Fair Park Reserve Champion. 1992 Blowing Rock Pleasure Driving Grand Champion. 1997 J D Massey Country Driving Grand Champion. Cabriolet- 1986 Southeaster Charity Park Roached Amateur Mare Reserve Champion. Last Waltz- 1999 Pro Am Fine Harness Junior Reserve Champion. 2000 Bonnie Blue Fine Harness Amateur Champion. 2000 KSF Pleasure Driving Adult 46 & Over Top Three. 2002 Bonnie Blue Pleasure Driving Reserve Champion. Valentine Supreme- 1985 Youngstown- 3 Gaited Over 15.2 Reserve Champion. 1986 Ohio State Fair- 3 Gaited Over 15.2 Reserve Champion. 1988 River Ridge 3 Gaited Show Pleasure A/T/R Champion. 1988 Ohio State Fair 3 Gaited Show Pleasure Novice Champion. 1989 Dayton 3 Gaited Show Pleasure Novice Champion. 1991 Ohio State Fair 3 Gaited Show Pleasure Novice Champion. 1992 Dayton 3 Gaited Show Pleasure Reserve Grand Champion. Fancy Supreme- 1988 Pin Oak 5 Gaited Open Reserve Champion. 1990 Big D Park Amateur Reserve Champion. Rullah's Supreme Dream- 1985 Tulsa Charity 3 Gaited Show Pleasure Jr. Ex. Reserve Champion. 1985 Alamo 3 Gaited Show Pleasure Adult Reserve Champion. Marinacy- 1985 Kansas National 3 Gaited Show Pleasure Adult Champion. 1986 Colorado Classic 3 Gaited Show Pleasure Adult Reserve Grand Champion. Denmark Bourbon Supreme- 1985 Texas Futurity 3 Year Old Fine Harness Champion. 1985 Missouri State Fair Junior Fine Harness Reserve Champion. Altadena Starlight- 2001 Monterey Springfest Park Pleasure Open Champion. 2001 Charity Fair Park Pleasure Junior/Novice Grand Champion. 2006 Monterey Springfest 3 Gaited Show Pleasure Jr. Ex. Grand Champion. CH Indelible Impression-1998 Gasparilla Charity 5 Gaited Amateur Grand Champion. 1999 All American Classic 5 Gaited Amateur Reserve Grand Champion. 1999 Kentucky Fall Classic 5 Gaited Amateur Grand Champion. 2000 Eastern States 5 Gaited Grand Champion. 2000 Penn National 5 Gaited Reserve Grand Champion. 2001 Syracuse Int. 5 Gaited Amateur Grand Champion. 2002 UPHA Spring Premier 5 Gaited Amateur Reserve Grand Champion. 2002 Syracuse Int. 5 Gaited Amateur Reserve Grand Champion. Peppermint Twist- 1993 Nebraska Charity Junior Fine Harness Champion. 1993 Missouri State Fair UPHA Fine Harness Reserve Champion. 1994 Oklahoma Centennial Park Pleasure Amateur Champion. 1994 Missouri State Fair 3 Gaited Show Pleasure Jr. Ex. Champion. RWC Harlem's Sweet Georgia Brown- (11 SR Points)- 1989 Tampa Charity Show Pleasure Grand Champion. 1989 Kentucky Fall Classic Show Pleasure Grand Champion. 1990 Tampa Charity Show Pleasure Adult Grand Champion. 1995 Mid-America Signature Show Pleasure Jr. Ex. 13 & Under Champion. Great Day In Harlem- 2005 Tanbark UPHA Fine Harness Champion. 2008 Tanbark Country Western Junior/Novice Champion. Minnesota State Fair COuntry Western Grand Champion. 2009 FASH Spring Country Western Novice Champion. 2009 Tanbark Country Western Novice Champion. 2009 Washington County Open Western Bridlepath Champion. 2010 Octoberfest Open Western Champion. Midnight Boogie (8 SR Points)- 1992 Carolinas Futuirty 2 Year Old Fine Harness Champion. 1993 N C State Championship UPHA Park Pleasure Champion. 1993 ASHAV UPHA Park Pleasure Champion. 1997 Eastern States Show Pleasure Adult Reserve Grand Champion. 1998 Children's Benefit Show Pleasure Adult Champion. 2000 Show Pleasure Adult Champion. 2004 Devon Show Pleasure Grand Champion. Irish Jasmin (10 SR Points)- 1995 Carolinas Futurity 2 Year Old Fine Harness Champion. 1996 Southeastern UPHA Park Pleasure Champion. 1999 N C State Championship Show Pleasure Jr. Ex. Grand Champion. 2000 Carolina Classic Show Pleasure Jr. Ex. Champion. 2006 Blowing Rock Show Pleasure Jr. Ex. 13 7 Under Grand Champion. 2007 Raleigh Spring Premier ASHAF Youth Pleasure Driving Reserve Champion. The Emerald Isle- 1993 Carolina's Futurity 2 Year-Old Fine Harness Reserve Champion. Tyger River- 1995 Carolinas Futurity Amateur Yearling Champion. 1996 Carolinas Futurity 2 Year Old Fine Harness Reserve Champion. 2006 N C State Fair Country Western Jr. Ex. Jr. Ex. Reserve Champion. WC Sparkling Aire- 1950 KSF National Futurity Weanling Champion. 1951 KSF Kentucky Futurity, National futuirty and Breeder's Stake Yearling Champion. RWC L L Native New Yorker- 1982 KSF 3 Gaited 3 Year Old Reserve Champion.